How to make no-bake cheesecake. With a layer of raspberry jam and chocolate. 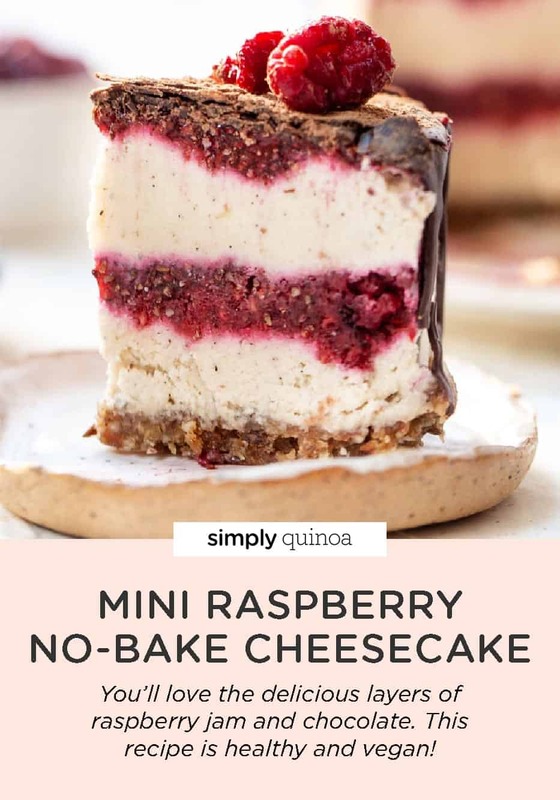 It's mini too, so one slice is the perfect amount, and is healthy and vegan! I find cheesecake to be pretty intimidating. It's something I've never attempted to make, so maybe my base is a little off, but it just seems hard. Like the water baths? The hours of slow baking? The fear of cracking? It just feels like it's not worth it. Not to mention, now I'm dairy-free and pretty much vegan, so rejiggering a recipe to exclude the main ingredients – cream cheese, butter, sour cream, and eggs – I think I'll pass. But what about a version that doesn't require any baking? 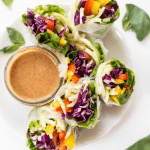 A version that is creamy and delicious, but also dairy-free and vegan? A cheesecake that is actually easy to make? Now THAT is something I can get behind! I started with my fave creamy vegan ingredient of all times: SOAKED CASHEWS. You've probably seen me use soaked cashews for a cream substitute before (my kimchi vegan queso and my white quinoa chili are faves around here), and since it works so well there, why wouldn't it also work in a dessert? All we need to do is allow some raw cashews to soak for about an hour. That softens them up and makes the blendable. Once they're soft we blend them up with coconut oil (which helps with the final texture), a little water, some lime for a zing, vanilla for flavor and maple syrup for sweetness. 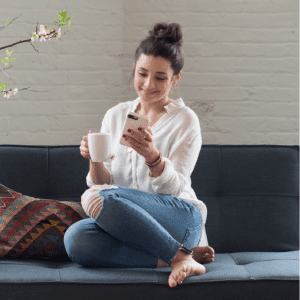 It's actually so easy and it tastes incredible! Then we move to the crust. Classic cheesecake uses a graham cracker crust which is held together with butter. It's not gluten-free nor is it dairy-free. So what's a gal to do? Nut crusts are standard in a lot of no-bake treats. They're usually just a blend of some kind of nut (pecans are my fave) and dates. You blitz them up in a food processor, then press them into your pan and you've got a crust! What I love about nut crusts is that they have a crunch but also natural sweetness. Dates have a natural caramel flavor and really help to add this sort of decadence to the dessert without adding anything artificial or refined. 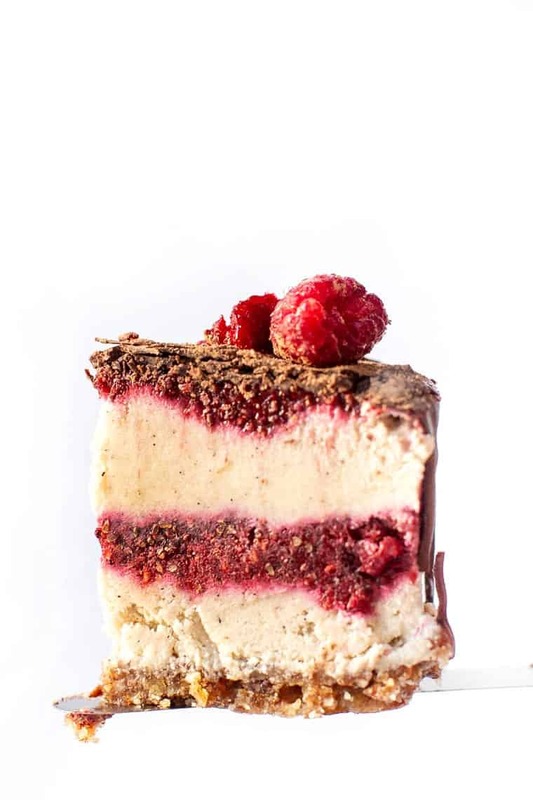 And since the nut crust has that perfect balance, when you cut through it in your no-bake cheese cake, you get this added layer of deliciousness to each bite. 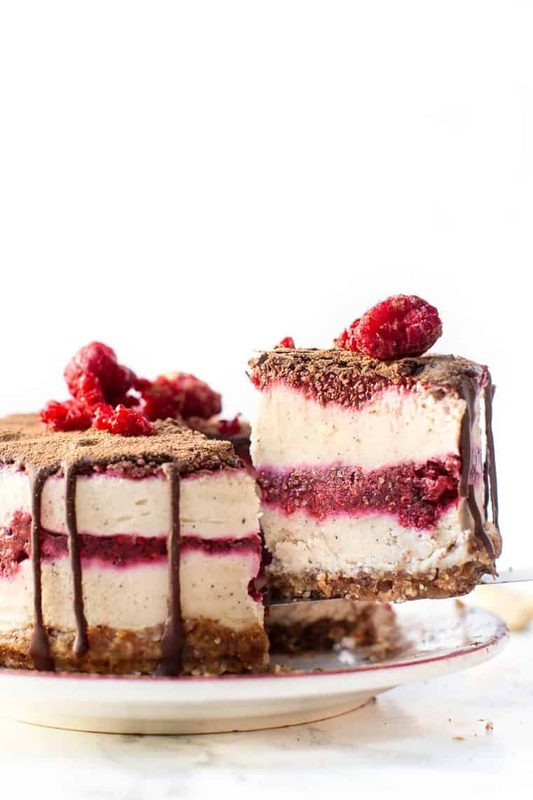 So I kind of created this no-bake cheesecake with Valentine's Day in mind, but truthfully it's perfect any time of year. 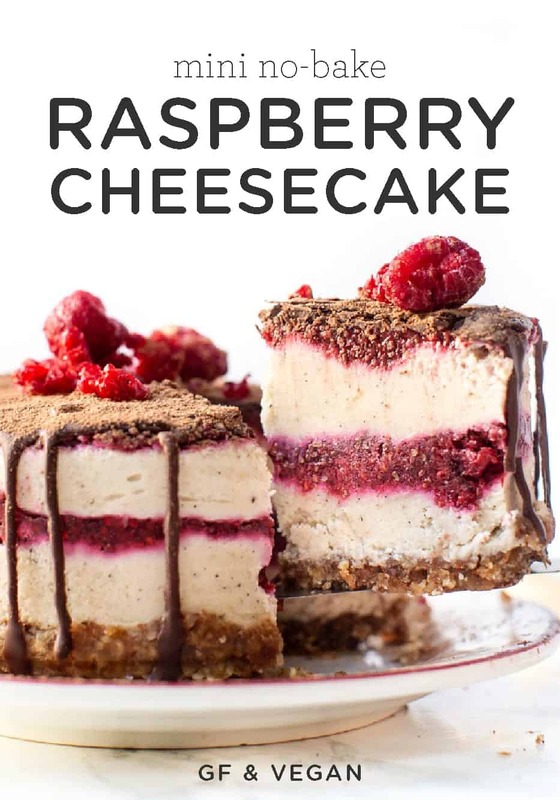 It's got 6 gorgeous layers, tons of flavor and that rich, creamy texture you crave when you're biting into a slice of cheesecake. It's pretty much heaven on earth. 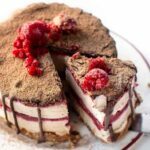 And the perfect dessert to serve for Valentine's Day, a special occasion or even just to keep in your freezer for a healthy after-dinner treat! 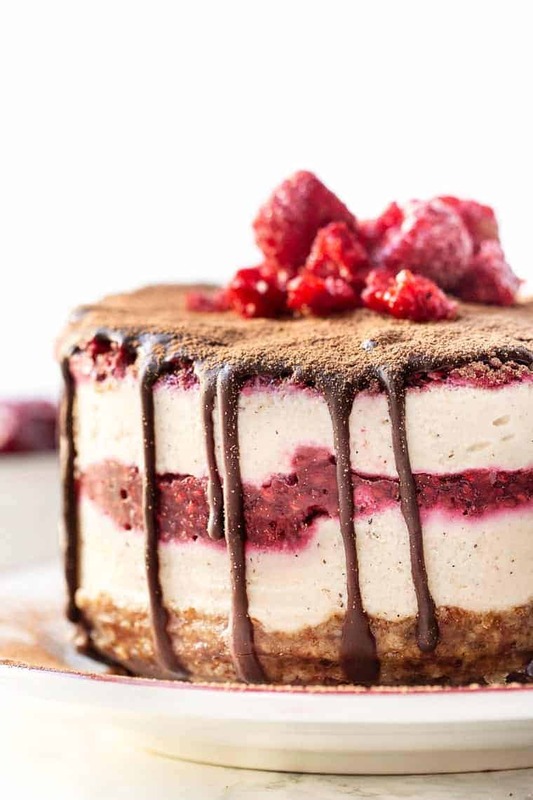 This raspberry no-bake cheesecake is the perfect sweet treat. It's made in a mini version, so one slice is the perfect amount, and is also healthy, vegan, gluten-free and also raw! Line the bottom of a 4" springform pan with parchment paper. In a food processor, combine the pecans, dates and a dash of the salt and process until a dough forms, about 1 minute. Press the dough into the bottom of the springform pan and set aside. 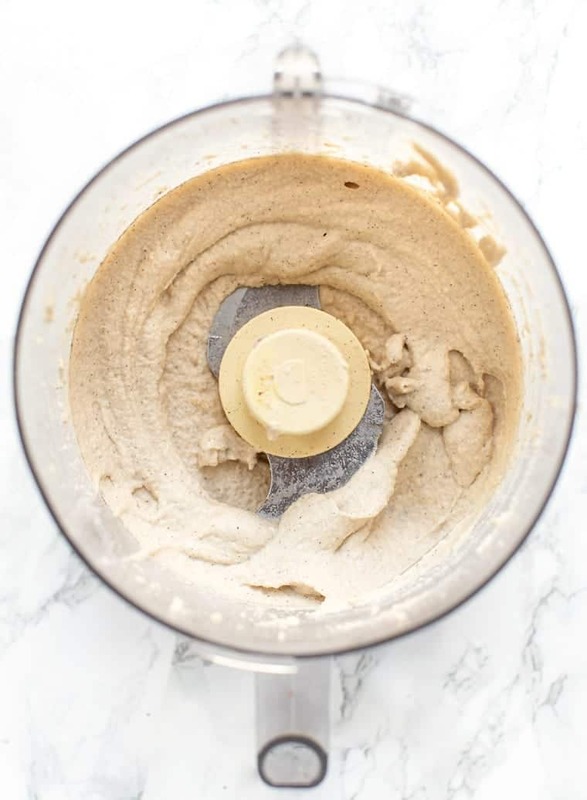 Place the filling ingredients (minus the jam) in the food processor and blend until high until smooth. Scoop half the filling into on top of the crust and smooth over with the back of a spoon. 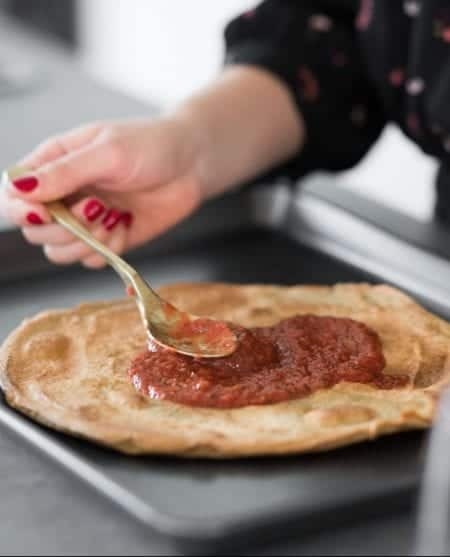 Spread a thin layer of raspberry jam on top of the filling, then top with the rest of the filling, top again with some jam. Place the cake back in the freezer for at least 5 hours, preferably overnight, until the cake is hard. Remove from freezer 30 minutes before serving. Just before serving, drizzle with melted chocolate then slice with a sharp knife and serve. * this recipe only uses 1/4 cup of jam. Feel free to swap out the chia jam with your favorite jam. 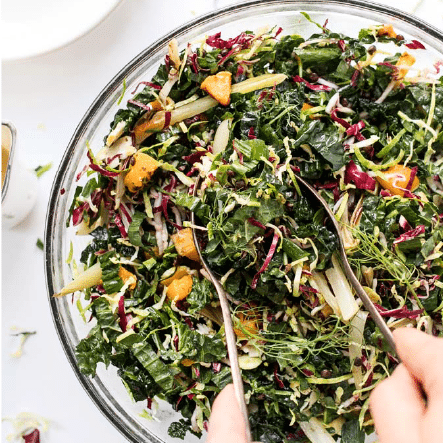 Or make a batch and keep the leftovers – my personal recommendation! At least a few months! I’m not 100% sure because it helps to keep it firm. You could try full fat coconut milk! I saw the video on Instagram and it mentioned almond milk! Is there almond milk in this recipe? yep! it’s almond milk or water 🙂 Just updated! So what if I dont have a 4″pan? Can I use 9″? Do I just double the recipe? What is the serving size of the finished product that you are basing the nutrional informiation on. Is it 1/4 of a pie? I see you use a 4 inch springform pan.. It is, yep! It’s in a small pan and honestly one slice (1/4 of the small pie), is plenty!